Stonefalls is a region that consists of the southern coast of the Inner Sea, taking a portion of the center of the province of Morrowind. Stonefalls is a land that benefits from the ashfall that comes from the volcanoes that encompass the region, fertilizing soil that is not too arid for agriculture. The region has history with war and conflict, most notably with the Nedes in an undisclosed conflict, and even the Akaviri in the Second Akaviri Invasion. There was a settlement called Stonefalls (alternatively called Balfalls) during the late years of the Third Era. The Brothers of Strife statues overlook Ebonheart. Sometime in the Merethic Era, the Nedes had a presence in Morrowind, specifically in Stonefalls. The Nedic tribes in Stonefalls had sought only conquest and spoils, despite signs of diplomacy from the Chimeri. The Nedes continued their conquest over Stonefalls, controlling most of the modern-day region within the span of a few short years, executing any elf in their path, considering them fair game, even young children. The Chimer armies were cut off from the Inner Sea, between those surrounded in Stonefalls, to those residing in Vvardenfell. Leading the battle against the Nedes in Stonefalls were the brothers, General Balreth and Legate Sadal, considered the greatest warriors of their time. At first, they attempted to push back the Nedes, but as they were slowly overwhelmed, their conflicts focused on defense and indirection, until they were left with remnants of their army in a ruined Daedric temple hidden in a valley. In a last-ditch effort, Balreth and Sadal had undergone a ritual to turn into what is now known as the, Brothers of Strifes, powerful entities that turned the ash of Stonefalls red with the blood of both the Nedes and the Chimeri. Eventually, both brothers were sealed into Ash Mountain and the Tormented Spire respectively, by a group of Chimeri Mages from Vvardenfell led by Mavos Siloreth. The Brothers of Strife's legacy would become the source of legend and myth throughout Stonefalls ever since. Years later in the First Era, the region of Stonefalls, along with the rest of Morrowind was invaded by the Nords of the First Empire of the Nords, at the time was under the reign of Vrage the Butcher. At this point in time around 1E 240, the Kingdom of Ebonheart was ruled by Kronin Ra'athim. The Nordic forces were able to displace King Kronin's reign and family from Ebonheart, taking hold of the city during the two-hundred years of their control. During this time, Kronin and his family had taken to guerrilla warfare throughout the Nordic Occupation, and even areas of Eastern Skyrim. 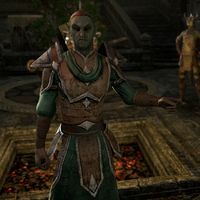 Eventually, Kronin's forces were able to retake Morrowind alongside the combined forces of Indoril Nerevar and Dumac Dwarfking, who would go on to form the First Council. The Dark Elven memory of those raidings had lived on for three-hundred years, such as the then leader of Kragenmoor, Yoriss Ra'athim, and even highwaymen in the general area of Blacklight and the Velothi Mountains. Following King Kronin's death, his eldest son, Cruethys was named the King of Ebonheart. It can be implied that at this point in time, the Ra'athim Clan held vast significance in Stonefalls, from Ebonheart to Kragenmoor. In 2E 572, the Snow Demons of Kamal had invaded the provinces of northeast Tamriel, sailing across the Sea of Ghosts and laying waste to the city of Windhelm in Skyrim. The Snow Demons were under the command of Ada'Soom Dir-Kamal, in the pursuit of something known as the "Ordained Receptacle." After bypassing the Rift, the Snow Demons entered Stonefalls from Fort Virak, facing the Dark Elves of the region and pushing them into Vivec's Antlers. The Dark Elves, under the command of Almalexia and Tanval Indoril, and by the time they were at Vivec's Antlers, the Dark Elves were having trouble facing the Kamali. Following the Snow Demons was the Nordic Army, under the command of Jorunn the Skald-King and the Ash-King, Wulfharth. However, despite the additional forces, the Kamali were proving to be able to withstand their might, that was until the arrival of the Argonians, under the command of Heita-Meen. The combined force was able to overwhelm Dir-Kamal's force, obliterating most of them before they had the chance to retreat. Thus concluded the Second Akaviri Invasion. Following the Battle of Stonefalls, the three leaders (Jorunn, Heita-Meen, and Tanval) had all gathered at the city of Ebonheart, to establish the Ebonheart Pact, an alliance of the three nations, creating as a means for mutual defense and survival, against the rising powers of the west, vying for control over the Imperial City and subsequently, all of Tamriel. Tanval Indoril was at the forefront of the Campaign in Stonefalls. Sometime around Morning Star of 2E 582, the Daggerfall Covenant had sailed across the Sea of Ghosts into territory of the Ebonheart Pact, on the outskirts of Bleakrock Isle. This was the earliest account of the Covenant's invasion of Pact Territory, before it ultimately landed onto Stonefalls. The villagers of Bleakrock Village were able to escape into Bal Foyen before the Covenant arrived there, forcing them to retreat into Stonefalls. The first battle of the Stonefalls Campaign occurred on the Indoril port-city of Davon's Watch, where the Covenant Armada besieged the city from the Inner Sea. In Davon's Watch Manor District, Tanval Indoril and Holgunn One-Eye organized a summit and had surmised a plan to break the siege. The skull of Nam Indoril was stolen from the Indoril Ancestral Tomb underneath the city and was used in the preparation of a ritual to summon one of the Brothers of Strife, Balreth. While Garyn Indoril held the western shore from the Covenant, the invading force was able to bypass the defense by climbing atop the stone cliffs, entering the Manor District. Once the ritual was complete, Balreth had rained hellfire across the Covenant Armada until they were able to back off and proceed into Western Stonefalls. But with the threat of Balreth roaming across Daen Seeth. The Pact must first focus on re-sealing Balreth back into Ash Mountain, who had already ransacked the town of Senie. An Agent of the Pact was sent to Othrenis where they must convene with the spirit of Mavos Siloreth and learn how to seal away Balreth. In the end, the Pact was able to keep Balreth in Ash Mountain, but the Covenant had still maintained a presence in Stonefalls. The Stonefalls Campaign continued into Zabamat, on the shores of Ebonheart. Alexandra Conele, a Covenant Commander launched an operation on the shores of Vivec's Antlers, conflicting with the nearby Pact Soldiers, and the local Dreughs of Vivec's Antlers. Conele had sought out the Coral Heart from the land-coral, in the effort to summon the second Brother of Strife, Sadal. After taking hostage a Dunmeri Lieutenant, Alexandra Conele was able to learn where the Coral Heart was located, in the inner sanctum found deep in the battlefield. An Argonian mage, Sings-With-Reed was able to convince the Dreughs to attack the Covenant and the Pact that the Heart is friendly. In the Coral Heart Chamber, Conele was able to be defeated and to preserve the Coral Heart, Sings-With-Reed sacrificed herself. With the Coral Heart in hand, the Pact pushed the Covenant towards the west, where the General Serien was able to take hold of Fort Virak, blocking the contact between the Rift and Stonefalls. Between Fort Virak and Ebonheart, the Daggerfall Covenant laid waste against the populace, targeting minor settlements such as Heimlyn Keep and Lukiul Uxith. General Serien had resorted to Necromancy, using the dead Covenant and Pact soldiers that died in battle to fight against the invading forces. Fort Virak is known for its impenetrable walls, lasting several sieges against other enemies. The only way to enter Fort Virak's courtyard, the Agent of the Pact had consumed a transformative potion that allowed to enter Fort Virak ethereally. One inside, Pact Soldiers from each side of the Velothi Mountains. In a grueling battle, General Serien was killed by Tanval Indoril and the Ebonheart Pact, but his spirit remained and took Tanval's son, Garyn Indoril with him. In grief, Tanval Indoril had stolen the Coral Heart from Holgunn One-Eye, seeking to summon Sadal to obliterate the Daggerfall Covenant. Tanval Indoril had fled south into the ashlands of Varanis, seeking out the Grandmaster of House Dres, at his home in Kragenmoor. In order to gain the access into the Tormented Spire, Tanval blackmailed Grandmaster Omin Dres by kidnapping his son and imprisoning him in the House Dres Crypts, iin exchange for access into the volcano. The Vanguard of House Indoril had followed Tanval Indoril into Varanis, taking hold of the city from the local barracks and an encampment outside the city. Under the command of Captain Dunveril, the Vanguard oppressed the people of Kragenmoor.. An Agent of the Pact had arrived onto the city limits, freeing Sen Dres from the crypts, and gained access to the Tormented Spire for the Ebonheart Pact. At the Caldera of the Tormented Spire, Tanval Indoril and the Vanguard had fought their way against the Chimeri that originally sealed Sadal. Tanval rendezvoused with the Ebonheart Pact, realizing his mistakes and seeks to re-seal Sadal into his prison. With the aid of Mavos Siloreth and the Chimeri spirits, the group was able to forever imprison Sadal, with Tanval's expense, as the Grandmaster of House Indoril had sacrificed himself. With both the Daggerfall Covenant and the Brothers of Strife defeated, the region of Stonefalls was saved. But all the while, the earliest recordings of the Llodos Plague had begun to appear throughout the region of Deshaan. Sometime around 2E 583, Vivec of the Tribunal had traveled to Ebonheart with his Archcanon, Tarvus. Vivec's visit to the city of Ebonheart had left an impression on the Warrior-Poet, commissioning the construction of another Ebonheart near his home of Vivec City. This would come into fruition in 3E 414 with the construction of Castle Ebonheart. During the Interregnum in the late Second Era, Tiber Septim had invaded the eastern province of Morrowind amidst the greater conflict known as the Tiber Wars. Tiber Septim's conquest over Morrowind had begun after his the success of his campaign in Hammerfell. Morrowind's defense had developed along the west, around the main cities of Kragenmoor and Blacklight, and around minor settlements like Cormaris View and Silgrad Tower. Among Morrowind's defense was an amalgamation of House Redoran mercenaries, as well as, House Nobles, Temple Ordinators, and the Buoyant Armigers. But things would become complicated when, instead of enforcing the western garrison, the Indoril and Dres sought to deploy guerrilla warfare, while the Hlaalu sought to make peace and the Telvanni would rather not bother. The battle between the Redoran and the rising Third Empire went into the favor of the latter, as the Houses slowly withdrew from the conflict and Vivec made arrangements to establish a peace treaty with Tiber Septim. This treaty would become known as the Treaty of the Armistice, and as a present to Tiber Septim, the Tribunal had given him Numidium, the Brass-God of the Dwemeri. 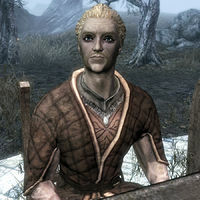 Tiber Septim's possession of the Brass Tower was a key point in the Third Empire's conquest over the Second Aldmeri Dominion. In the end, the region of Stonefalls, as well as, its leading settlements were annexed into the Third Empire. Stonefalls is generally located along the southern coast of the Inner Sea, the large body of water that separates the district of Vvardenfell from the rest of mainland Morrowind. It is bordered by several other regions, such as Deshaan in the south, Bal Foyen in the east, and the northwest across the Velothi Mountains. 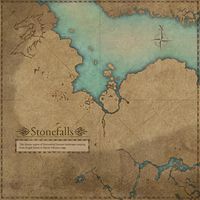 Stonefalls is divided into three smaller regions, known as Daen Seeth in the east, Zabamat in the northwest, and Varanis in the southwest, each divided by mountains. In Stonefalls, there are six common types of lava, all of which documented in a field guide. The lava in Stonefalls generally comes from the twin volcanoes, known as Ash Mountain and the Tormented Spire. All throughout the region, there are deposits of Flint and Ebony, as well as, Heart Stone in the rivers of the Brothers of Strife and Volcanic Glass from the twin volcanoes. There is also large deposits of Sulfur due west of Ebonheart. Despite the harsh environment of Stonefalls, flora grows abundantly in the region. The typical Emperor Parasol can be found throughout the ashlands, but unique flora such as Roland's Tear, which are found in sacred areas of the Tribunal, such as the three shrines found outside of Ebonheart. When a group of Argonians settled in Ebonheart's waterfront, they established a village with a Hist Tree in the middle. It was re-supplied by Ashreeds that grow around the waterfront. In the area known as Vivec's Antlers are forms of bizarre, bioluminescent Land Coral, very uncommon in Morrowind. There is a vast network of caves called the Fungal Grotto, which is known for the abundance of Emperor Parasol that has overgrown the Chimeri ruins inside and enveloped it in its moss. Typical for a region in Morrowind, there is a wide variety of fauna found in Stonefalls. Because of the abundance of volcanic activity in Stonefalls, there is a large number of Shalk, and even Flame Atronachs. Then throughout the coast and the crags, are the Dreugh and the Netch. As well as, the Nix-Hounds, and the Cliff Racers. Found near the farmlands, in natural caves, and ruins, are Spiders and reanimated Skeletons. Making up the natural borders of Stonefalls are the Valus Mountains, and the Velothi Mountains. When compared to other parts of Morrowind, there is a very small amount of Dwemer influence in the region of Stonefalls, with the only-known Dwarven Ruin was the Inner Sea Armature, whose original name was lost to time. On the other side of the mountains are the regions of the Nibenay Basin in Cyrodiil, and the Rift in Skyrim respectively. Much like the rest of Morrowind, the region of Stonefalls is mainly-populated by the Dark Elves, both the civilized ones, and the Ashlanders. Most people in Stonefalls live in the three main cities (Davon's Watch, Ebonheart, and Kragenmoor). All throughout the countryside are small towns like Senie and Lukiul Uxith, and private farmsteads and mining colonies, as seen with Sathram Plantation, and the Sulfur Pools. Western Stonefalls is populated by private farmsteads. This is because of the ashfall coming from the twin volcanoes of Stonefalls, Ash Mountain and the Tormented Spire. But like the rest of Morrowind, Stonefalls' flora had adapted to the ashlands, resulting into unique plants that the locals cultivate such as Ash Yam, and Saltrice. Farming in Stonefalls is a large industry with the presence of Kragenmoor, known as the main farming hub in Stonefalls. Kragenmoor is surrounded by plantations and farms, going as far as the coast of the Inner Sea. But among the farmers, there are also miners. Particularly, around the various mountains that sprawl across Stonefalls. The Emberflint Mine in the outskirts of Ebonheart is a prime source of Flint. Beyond the walls of Davon's Watch lies the Strifeswarn Kwama Mine. Ebony, in particular, has significance in the region. Not only has the Iliath Temple has an abundant amount of Ebony veins underneath it, but the royal house of Ebonheart, the Ra'athim Clan are miners by heart and have lucrative mines across their domain. In Stonefalls, there are two known tribes of Ashlanders. The Kagesh Tribe live in southwestern Stonefalls, near the Iliath Temple. They are hostile and aggressive, much like other Ashlander tribes. The Ulath Tribe are found somewhere in western Stonefalls. The Cave of Memories on the edge of Varanis, is considered the ancestral burial ground. All the while, there are two prominent tribes of Goblins, such as the Shadowsilk Tribe, who ransack the northern farmlands, and the Murkwater Tribe, who live in the Valus Mountains around the Fungal Grotto. Both Davon's Watch and Ebonheart are the only harbors on the Inner Sea in Stonefalls, near other notable port-towns such as Seyda Neen and Vivec City, found on the other side of the sea, on the island of Vvardenfell. The fort-town of Castle Ebonheart on Vvardenfell contains the district headquarters of the East Empire Company. All the while, on the mainland, travelers would often use Guar to carry goods throughout the land. A practice that is used not only by the House Dunmer, but the indigenous Ashlanders and Argonian caravaneers use the Guar in their travels, and trade between one another. A banner of House Dres. "House Dres, one of the Great Houses of the Dunmer, prized agrarian pursuits above all else. The House built its fortune on saltrice plantations and slave labor while maintaining a persistent tradition of Daedra worship and ancestor reverence. Dres controlled the southeastern region of Morrowind, even extending its influence into parts of central Morrowind. — Salomar Dres, Understanding House Dres"
The province of Morrowind is governed by five ancient clans known as the Great Houses, each of whom represents a different aspect of civilization. The two that govern over Stonefalls are the Great House Dres, and the Great House Indoril. House Dres' sphere of influence revolves around agriculture and overall agrarian society. They were at the forefront of the slave industry. Traditionally, House Dres occupies the southeast, near the port-city of Tear. But it has been known to have certain areas across central Morrowind, such as Kragenmoor and Ebonheart during the mid-Second Era. The city-state of Kragenmoor is the Dres' seat of power in Stonefalls. Not only is the Grandmaster's Palace located in the center of Kragenmoor, but the House Dres Crypts are found just west of the Palace. The city-state of Ebonheart found in the dead center of Stonefalls has traditionally been ruled by the Ra'athim Clan, who were subsequently absorbed into House Hlaalu. Though in 2E 582, Ebonheart was controlled by House Dres, through Drathus Othral. 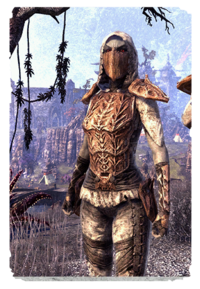 House Dres is also known for their persistence in maintaining ancestral traditions, such as Daedra-worship and ancestral reverence, and because of this, they have gone through various lengths to keep Dunmeri society away from foreign influence, they are proud isolationists. But as time went on, House Dres had slowly become accustomed to foreign interest, specifically in the Third Empire. In 3E 432, the High King at the time, Helseth Hlaalu had abolished slavery in Morrowind, and with it, both the Dres and Hlaalu had begun to evolve with the times. House Indoril occupies the southern Inner Sea and the central east coast. This would encompass the city of Davon's Watch, the port-town on easternmost Stonefalls. House Indoril's sphere of influence revolves around religion and the preservation of various Dark Elf customs. House Indoril were orthodox supporters of the Tribunal Temple, the main religion of Morrowind that revolved around the three living-gods known as the Tribunal. The Tribunal's reign over Morrowind had lost for most of the province's history until in 3E 427, when the Nerevarine had appeared and fulfilled the Nerevarine Prophecy, which led to the deaths of Almalexia and Sotha Sil, as well as, Dagoth Ur. With the subsequent disappearance of Vivec and the events of Red Year in 4E 5, the Tribunal religion had a large decline. With the death of the Tribunal, came the New Temple. The Dissident Priests of Holamayan arrived onto the weakened House Indoril, bringing back the original religion revolving around the Good Daedra (Azura, Boethiah, and Mephala). Underneath Davon's Watch is an abandoned Tribunal Temple which now serves as the Outlaws Refuge, and on the cliffs around Davon's Watch are one of the House Indoril Crypts. As many know, throughout Morrowind are Ancestral Tombs created for various families throughout the province, to inter, or even commune with their dead. The only known tombs are the Dres and Indoril, but in Daen Seeth lies Othrenis, a necropolis found just south of Ebonheart. Othrenis dates back to the time of the Chimeri, with one of their most well-known occupants was Mavos Siloreth, who sealed the Brothers of Strife at the end of their onslaught. There are many battlefields throughout Stonefalls, filled with the dead soldiers that perished there. One of the twin volcanoes of Stonefalls. It is where Balreth, the Brother of Strife, is sealed. A sprawling Daedric ruin that sits underneath two stone statues of the namesake. An important port city that is controlled by House Indoril. It is their main holding in Stonefalls. The former capital of Morrowind. It is a port town that was the home of the Ra'athim. The central farming hub of Stonefalls that feeds the entire region. One of the twin volcanoes of Stonefalls. It is where Sadal, the Brother of Strife, is sealed. A large battlefield consisting of bizarre Land Coral that is uncommon in Morrowind. ^ The description of Coorper Saltrice Steamer in ESO. This page was last modified on 27 February 2019, at 18:19.